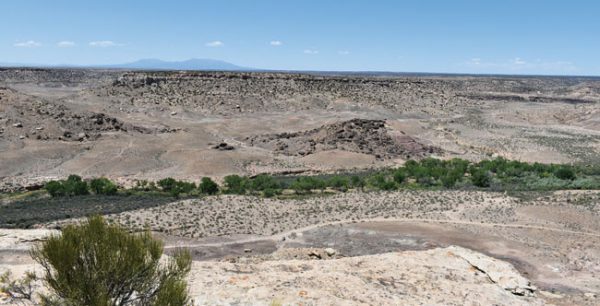 Green vegetation clings to life along a creek snaking across Canyons of the Ancients National Monument in the midst of an otherwise arid landscape. National forests are closing. Wildfires are raging. Animals are dying in their quest for water. 2018 is shaping up to be one of the driest years on record in the Four Corners area. Relief may be on the way, but it won’t likely arrive for another month or more. And even then there is no guarantee how substantial or sustained it will be. 2002 was a year of disastrous drought across the region. So far, this year is looking every bit as bad, with one key difference: Last year saw bountiful precipitation that filled area reservoirs, and thus there was good carryover going into this summer. “We basically are tracking very similar to 2002,” said Ken Curtis, a hydrologist with the Dolores Water Conservancy District in Cortez. According to the U.S. Drought Monitor, the Four Corners area is currently classified as in exceptional drought, the worst category. That’s as of May 29. According to data collected by weather observer James Andrus, a little under a half-inch of moisture fell in May, about 58 percent of the 30-year average for the month. That followed a long stretch of months with below-average precipitation. In October, precipitation was at just 4 percent of the historic average for the month. November and December each saw 2 percent of average. January got 85 percent, but then came February (33), March (22), and April (45). So the balmy winter that had people rejoicing because they didn’t have to shovel snow has had a brutal impact of a different sort. Through May, Cortez was at just under half of the yearly average for the water year, which runs from October through September. A SNOTEL map showing snow water equivalency as of June 4 showed indicated that, statewide, Colorado’s high country was at 22 percent of the usual levels of snow. In the San Miguel, Dolores, Animals and San Juan river watershed, the level was just 5 percent. The drought is spread across the Four Corners states in varying degrees. At the end of May, officials with the U.S. Forest Service closed the 1.6-million-acre Santa Fe National Forest in northern New Mexico to all recreational activity. The highly unusual measure was reportedly implemented because people were largely ignoring the fire ban in the forest. The closure came even as firefighters were battling an enormous, human-caused blaze, the Buzzard Fire, in the Gila National Forest in southwestern New Mexico. That epic fire had reached 37,000 acres by June 5 and was still just 50 percent contained. At the same time, New Mexico was also combating the Ute Park Fire in the northeast, which was about 37,000 acres and just 25 percent contained by June 5. The cause of that fire was unknown. To the north, some 800 homes were evacuated because of the 416 Fire some 13 miles north of Durango. That blaze was relatively modest in size, about 2400 acres as of June 4, but it had prompted recurring closures of the highway between Durango and Silverton, U.S. 550. The Durango & Silverton Narrow Gauge Railroad was forced to suspend operations until at least June 10, a blow to tourism, and the scenic Hermosa Watershed area of the San Juan National Forest was closed to visitors. To the west, at Gray Mountain on the Navajo reservation in Arizona, 191 feral horses were found dead early in May at a drying stock pond. “These animals were searching for water to stay alive,” said Navajo Vice President Jonathan Nez in a release. “In the process, they, unfortunately, burrowed themselves into the mud and couldn’t escape because they were so weak.” The skeletal figures of still-living feral horses continue to plod across the Navajo Nation, starving for forage and desperate for water. And June is typically the driest month of the year in the region. People are pinning their hopes on forecasts for an above-normal monsoon season. Monsoons are annual storms resulting from subtropical moisture that tend to occur in mid-July through mid-September. Sometimes they do come earlier. Pringle said the area is emerging from the second La Niña year in a row, and that may bring some relief. “If you look at the climatology of two consecutive La Niña years, the second is usually drier than the first,” he said. La Niña is one half of a phenomenon called the El Niño-Southern Oscillation, or ENSO, cycle, according to the National Oceanic and Atmospheric Administration. The cycle involves fluctuations in temperature that occur between the ocean and atmosphere in the Pacific Ocean. The fluctuations can have major impacts globally. Typical El Niño effects include warmer-than-average temperatures over the western and northern United States, and abundant precipitation in the southern part of the country. La Niña impacts tend to be opposite those of El Niño, meaning drier conditions in the area. Right now, it appears an El Niño year could be coming, which could mean above-normal moisture next winter in the local area. Curtis is skeptical of the impacts of the ENSO cycle on the Four Corners. “El Niño is just certain conditions, particularly to the south, that tend to favor wetter periods. We are in a transitional area [where the ENSO cycle may or may not have an effect]. The forecast for El Niño doesn’t mean a lot. I personally don’t track it. “A year or two ago, 2015 or 2016, was an El Niño but it didn’t pan out to much moisture for us. Those are long-range, mass conditions, global conditions. They may or may not have a dramatic effect on us. The current forecast for a strong monsoon season has nothing to do with the ENSO cycle, he said, but with conditions in the Gulf of Mexico and to the south in general. “We’re hopeful for monsoons,” Curtis said. “They generally come more often than not here. The strength can vary a lot. 2012 we didn’t really have any, and last year they were pretty weak. Even when California got a big jump in precipitation in March of this year, the moisture stayed north of us. What storms do blow up, he said, typically will bring lightning and wind but not much rain – horrific conditions for firefighters. Curtis said the carryover in McPhee Reservoir has definitely mitigated the impacts of the drought on irrigators. The problem now is what lies ahead. “The [Dolores] river is dying and will not rise until some significant precipitation comes along. Next year is our big concern because we will effectively end the year close to empty [in the reservoir].